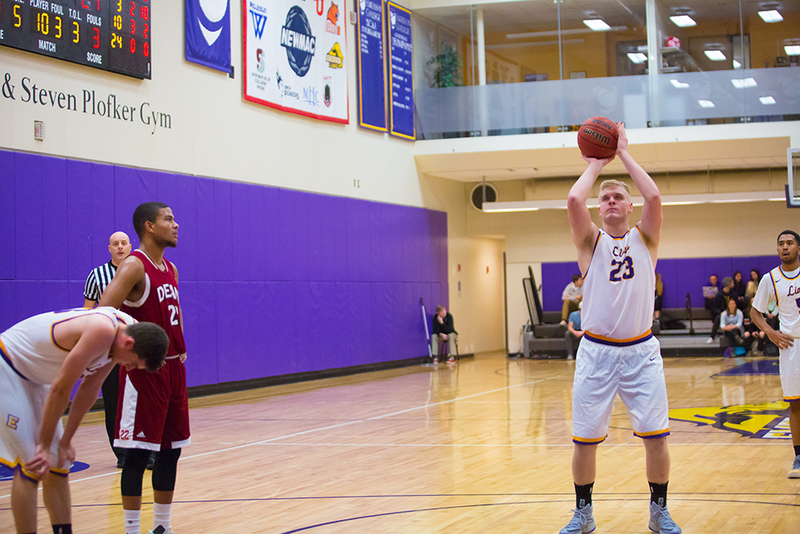 Alex Mrusek shoots a free throw against Dean. Freshman forward Alex Mrusek tries to block a shot in Emerson’s win over Dean last week. Forward Ben Holding takes a shot against Dean as coach Bill Curley looks on. Geoff Gray puts up a three against Dean. Guard Kent Ellertson has scored 24 points in seven games. There will be no tigers, but there will be Lions and Bears when Emerson’s men’s basketball team travels to Providence to meet Division I Brown University on Friday night. The game, scheduled for 7 p.m. at Brown’s Pizzitola Sports Center, will be Emerson’s third meeting with a Division I program in the past three seasons. Last fall, they traveled to Bryant University, and in 2014, the team faced off against the University of Hartford in Connecticut. The trip to Rhode Island to meet an Ivy League opponent is part of Lions head coach Bill Curley’s push for an intense nonconference schedule. This fall, Emerson already faced Amherst and Tufts, the first and fifth ranked teams in NCAA Division III. Curley said the difficult slate is what current players and those considering Emerson are looking for outside of NEWMAC play. Emerson lost 83-50 to Hartford in November of 2014, and dropped their 2015 matchup with Bryant 82-69. Then-sophomore guard Michael Sheng was a standout in the Bryant loss, scoring 17 points on 6-of-10 shooting, and draining five of his seven three-point attempts. Forward John Geary also had 13 points. Brown defeated Bryant in nonconference action last month, dropping the Bulldogs 91-90 on Nov. 28 in Providence. While conventional wisdom might dictate otherwise, Lions associate head coach Jack Barrett said he goes into Division I meetings with the same expectations as any other night. Brown’s senior forward Steven Spieth will pose the toughest test for Emerson. Spieth is averaging a team-leading 17 points a game, and is also pacing the Bears on the glass with 6.3 rebounds per game. He is the brother of U.S. Open winning pro golfer Jordan Spieth. Per NCAA policy, Division I teams are allowed to schedule two games per season against non-Division I opponents. Because Brown is a member of the Ivy League, it cannot offer athletic scholarships. Emerson’s trip to Brown is its penultimate game on the East Coast in 2016. The Lions will host Curry College on Sunday, then will break for the holidays before embarking on their two-game Los Angeles trip, which begins on Dec. 28. The Lions don’t start NEWMAC play until Jan. 4 against Babson. Unlike the women’s team, which had matchups against MIT and Clark mixed into their pre-holiday schedule, conference and nonconference games are separated for men’s basketball. Barrett said the trip down Interstate 95 to meet Brown will be memorable regardless of the result. Visit www.berkeleybeacon.com/sports for full game coverage.